Client management is so tough that some agencies and freelancers choose to work as contractors for other agencies and earn less - just so they don’t deal with clients directly. There's no silver bullet for hassle-free client management just as there's no quick fix for complicated relationships. But, there are ground rules that make client management easier. In most agencies, only project/account managers deal with clients directly. A client never gets in contact with designers, developers, and copywriters; they never see how the sausage gets made. That makes sense sometimes - creatives have a reputation for being divas and difficult to deal with. If a client asks to make the logo bigger, a creative lacks the social graces and diplomacy to respond. In order to successfully deal with clients, all a person has to be is normal and detached. It's very difficult to remain neutral when someone criticizes your work, and respond with tact and grace. That's why project managers take on all the communication. Plus, it's easier for clients to deal with one person than several. Sometimes, clients micromanage everything on a project if they get access. They tell your team members what to do, when their deadlines are, and introduce panic. The team ends up even more frustrated and feel like they can't collaborate among themselves because the client is watching, monitoring, and judging their every step. So what usually happens is that project managers act as intermediates between the team and the client - thus excluding the client from the process. When a designer needs something, they need to ask a client through project manager. It's like asking person A at a dinner table to ask person B to pass the salt - it's ridiculous. Not to mention all the CCs and BCCs that overflow your inbox with 300 emails a day. Many agencies exacerbate the problem by building a wall around what they're doing and leaving the client on the other side. The client then feels animosity and distrust, because they’re shut out. That's a huge mistake - the client should be inside, doing heavy lifting and being your biggest collaborator. These are all valid concerns if you have a broken processes and shaky organization. It's like when you have a bad software and instead of replacing it, you make suboptimal decisions - but sooner or later, that house of cards will collapse. Most creative and marketing agencies outsource work to other specialized agencies and freelancers. So one agency will do marketing strategy and hire agency A for production, agency B for post-production, agency C for promotion, and so on. Other agencies are easiest to collaborate with because they know how things work. 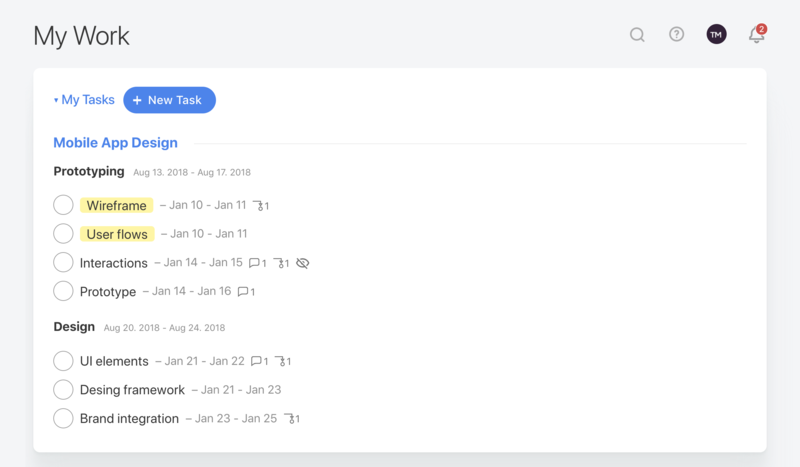 In ActiveCollab, main agency will create a project and invite people as team members from other agencies on it (and categorize them by company). Small and medium size businesses aren't usually familiar with collaboration process and need a lot of hand-holding. The good news is that they're flexible and you can get a lot of things done rather quickly. Invite them on a project and show them how you work behind the curtains - they'll appreciate the show and get a chance to learn something new. The hardest question for them seems to be “name 3 websites you like, 3 you dislike, and why” because they don't know where to start; so make their job easier by suggesting some solutions yourself and asking them what they think. Corporations are the most difficult to collaborate with because there are a lot of stakeholders involved, with varying degrees of authority, needs, and wants. There are a lot of approval stages, hoops to jump through, and CCs to exchange before any decision can be made. You often get assigned a contact person in the organization through whom you'll have to go to in order to get anything, which can be time consuming. The key to dealing with corporations is to make the job for the other side easier and save them time by keeping all the information structured in a project, with written trace of every discussion and decision in one place. The most pain free way to work with clients is to involve them from the start. Make it clear that you see them as a team member and expect cooperation and support during the entire project. Go one step further and specify in your contract what exactly you expect of them. Honesty is the always best policy, for both sides. Disclose what you do and if you outsource work to contractors. The client probably won't care because they hired you to get something done and how you do it doesn't matter as long as you deliver. Good designers take orders and hand over exactly what a client wants. Great designers dive deep to uncover what a client actually needs. Invite a client on a project so can see what you're working on - that is, if they're interested. Even if they don't track progress by going through tasks themselves, it's an act of good faith. When you show them you have nothing to hide, they'll trust you more. Plus, you show them how hard you work so they know where their money goes. Then they can see what you're working on, provide feedback, and upload content and assets you need. Some agencies don’t want the client to see everything so they create two projects: one for the client and one for the team. This is not a good solution as it requires double the work and upkeep - and neither are billable activities. It's much easier to let clients see everything by default and hide what's necessary on case-by-case basis. If you have some sensitive information or just want to discuss something internally within the team, you can hide individual tasks, discussions, and files. This is particularly useful when you don't want clients to see preliminary designs or hi-res documents before they pay. Clients have limited access, but if you have a client who's especially collaborative, enabling the Client+ add-on will let you assign tasks to the client - after all, clients do have responsibilities, just like everyone on the project. They still won't see other projects, hidden stuff, people on other projects, or any contact info. Involving client sounds nice in theory but it’s difficult in practice. Some clients don't want to be overwhelmed with information or too involved, which is perfectly fine. In those cases, a project manager will personally work with the client, update them, ask for feedback, and review progress. 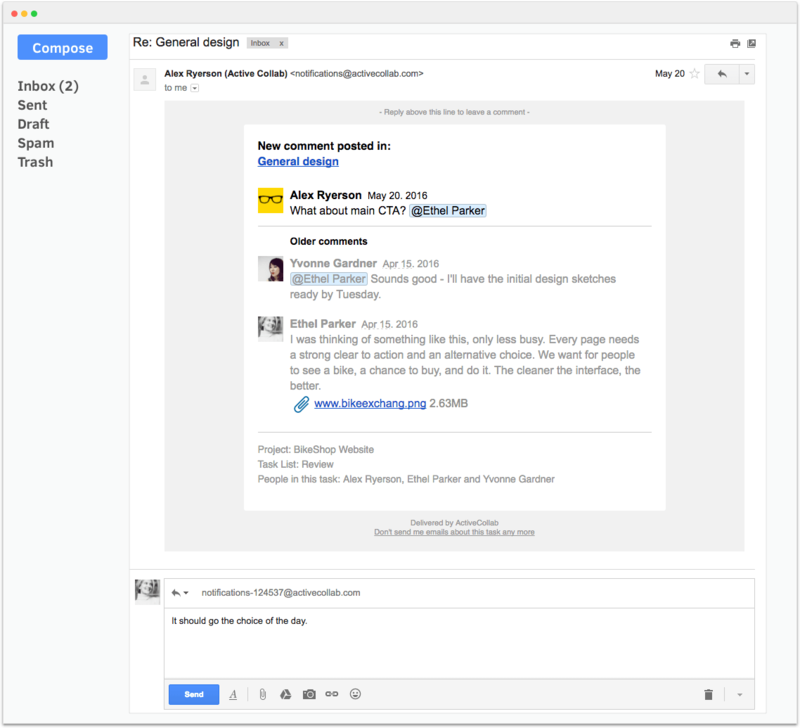 and flexible enough for clients to just reply to tasks and discussions via email. Email won't be replaced no matter how inefficient it can be because it's convenient and everyone knows how to use it. 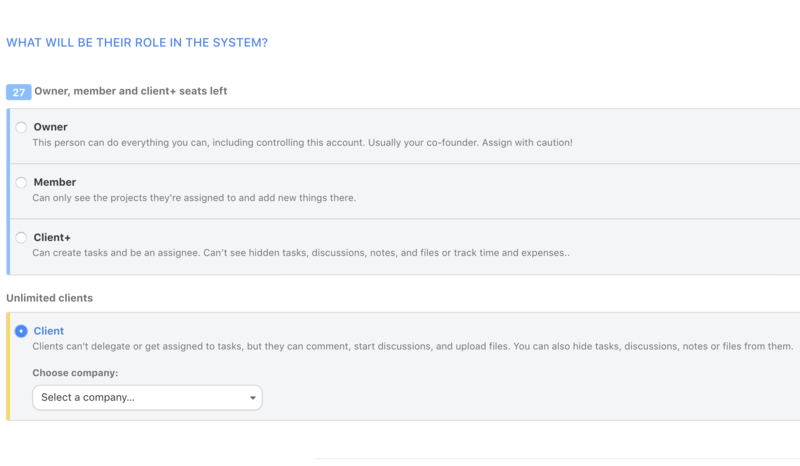 You simply set up an account for your clients using their email and subscribe them to tasks where they’ll receive notifications when there's a new comment. This way, they get updates automatically and they can reply from their inbox. Clients can even send an email to a project address and it will be converted to a discussion. A team can then treat those discussion as new tasks initiated by the client, convert them to a task, and treat as another to-do. Each project gets a random email address, which is hard to remember for clients. To make it easier to remember, set up an email forwarding so all email from one address goes to the project. For example, if you own @agency.com domain, you can create a new account, like client-project@acme.com, and set up email forwarding so every email that goes to that account is forwarded to the project's email address. This way, a client can easily remember the address when they want to make a request. Clients hate surprises or not knowing what's going on. So you have to make it a habit to update them on your progress, even if they don't ask for it explicitly. Not posting updates on progress is incredibly frustrating. You can’t just isolate yourself and work — you have to constantly communicate progress, even if it doesn’t contribute to the work directly. Projects somehow always end up slipping behind schedule. By keeping clients updated each week, you can address the problem on time together. Plus, negotiating additional time or budget will be a lot less awkward. 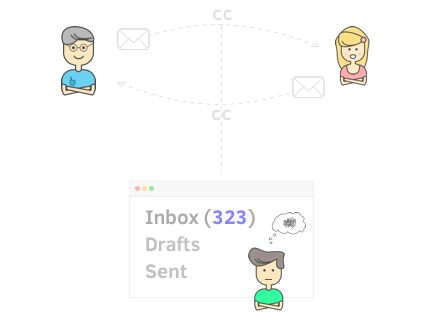 ActiveCollab can save you a lot of time by automating reporting for you, especially if your client wants to be constantly in the loop.The client gets an automatic recap email every morning at 7 AM so they can see what happened the day before. If they want more information, they can access the Activity page to see what happened on all their projects or check Updates to see if they have any notifications that concern them personally. Answer client messages as soon as possible. When a client doesn't hear anything from you, they can get paranoid - the primary concern being that you’re twiddling your thumbs while collecting a fat paycheck. When you're in the same city, the client feels that if something goes wrong, at least they can get a hold of you in person. But when they're remote, they get agitated and suspicious when you don't return their messages. No matter how much you communicate through messages, find some time to schedule a call to keep them updated. It’s better to lose some time rather than damage the client’s trust. If you're working remotely, be very available and return calls and emails as soon as you can. Let clients see for themselves how much you work. Even if you’re working like a dog and can’t spend additional time debriefing the client, you have to. Agencies often spend more hours than they bill because they don’t have any proof of work. The solution is to track time on everything you do and let the client see work and timesheets for themselves. They’ll start valuing your work much more once you get organized and gain real leverage. During the project kickoff, you agreed on the scope, budget, and schedule with your client. But things you can't predict change the full project scope. Sometimes a client finds out they need something else in the middle of the project; or a project is more project complex than you estimated at first. There's nothing wrong with changing the scope - it's actually advised that you set aside time in your plan for reviewing the initial agreement. Revising the statement of work will come up naturally during the conversation with your client if you kept them updated throughout the project. When you first notice a project slipping in small places, you have to inform the client. Small slips here and there build up into significant schedule and budget problems over time. Don't sweep things under the rug hoping not to let the client down. Slips happen and it's better to talk about them openly than to inform the client the budget is spent, without them knowing where it went. People are optimistic by nature so don't let them assume everything's going great when it's not. Sometimes you'll miss a milestone because the client didn't leave feedback on time. This is another problem that regular updates solve. If you make it clear to your client that you're running late because of them, they'll know it’s not your fault. Plus, you can catch the problem early and discuss how to improve the workflow in the next stages of the project. For example, a client forgot to think about the content or icons and asks you to come up with something. You need to revisit the statement of work and see how it impacts the project and your bottom line. Sometimes by taking work, you’re actually hurting your profit. Never take on "small jobs" without negotiating. Some clients are reluctant to revisit the contract because they want to use you as as much as they can and get their money worth. The solution is to add each small job as extra line-items in your weekly budget reports so the client can see how they impact budget and schedule. Try not to please a client too much or else they'll start pushing you around. If you try too hard and take additional work without negotiating, you’ll lose money. Project managers usually justify the loss by cross-selling or upselling services, hoping to gain more business in the future, but that's a risky road. What’s worse, you'll drive your team to work more (without paying them more), and you risk losing your best workers that way. When you change a project requirement to factor in more work, give the client a preliminary estimate, a revisited schedule, and the proposed addendum to the statement of work. Just like you did during the client proposal, explain the benefit behind each item. If you're doing a responsive website, don't just tell it'll look better on mobile - explain how it impacts their SEO, user satisfaction, and their bottom line. Be sure to consult the Project Timeline report to see how this new work impacts your responsibilities to other clients, and price accordingly. People think a client hires you and you slave for days to finally present your masterpiece in a grand reveal, which the client loves and showers you with praise and money - except it doesn't work like that. In fact, it's the opposite. Work approval isn't a one time event but a process that happens quietly throughout the project. The exceptions are small items (like banners and icons) but even that's up for debate. Going into a project, you need to know who on the client side provides input, who gives feedback, and who approves it. If your point of contact doesn't have the decision-making authority, plan for it by setting aside some time for decision making as your contact will have to push their busy bosses for feedback, which will take time. Try to talk to each stakeholder on the client side even if you don't need their input. You never know who can affect the decision making so talk to each department that's affected by your work purely out of political reasons. Plus, inquiry is flattery and inviting people to participate empowers them. Remember that there are more stakeholders than you might initially think. Executives have to defend your work as a part of the overall strategy; customer service has to support it; sales has to sell it; and production has to maintain it. Make them all your allies by involving them, and they'll defend your work because they are in part responsible for it. If you don't include others, you'll have a hard time presenting work because the group you skipped will challenge your recommendations and ask why you didn't consider this or that - thus making the presentation will become a debate. But if you involve them, by the time the formal proposal comes up for approval, the decision is already made and the final meeting is a formality. When you show work often, you can get a feel of how the client thinks and steer the project accordingly. Plus, you chip away at a client's natural situational anxiety. Once a client pays you a big deposit, they're anxious to know what they're paying for. When they see results, they'll feel better about the relationship. That is one more good reason to invite them on projects. Be careful what you present though. If you're presenting backend, keep the frontend very rough because clients cling to visuals; if there are no visuals, they can focus on functionality. Don't let clients have a lot of options. It's better to have three good initial designs than presenting ten great ones - more choices make clients indecisive and less happy with the end product. In fact, presenting only one is a completely viable strategy. Steve Rand had a rule of making only one logo and no rework, and the client had to pay fully for the work even if they didn't like it. It's suffice to say, clients were very happy. Sometimes, less is more. When showing work, be sure to let a client know how you arrived to the latest iteration. Show the the first draft, why it didn't work, what you did then, your thought process, and the steps between. This will stop comments like "make logo bigger" because you've educated the client and made them like you. The faster you can find out what the client wants, the faster you can finish a project and the less time you’ll spend on solutions that don't work. 90% of your job is being rejected and getting upset isn't worth it. Being rejected is the hazard of doing creative work. It's extremely helpful when you learn the “why” of the rejection because you can address and bypass the objection. Sales pros have a clever technique called the “alternative close”: instead of asking "do you like the solutions" you inform them "we can pursue this direction or that direction". By doing this, the negotiation becomes not if, but how. But if arguing about a task is going to take as long as doing the task, it's better to just do it. Some clients reject the first draft and don't even bother reviewing it. They expect the first idea won't be good and they're waiting for you to step up your game. Once they reject you a few times, you earn their attention. Other clients are afraid to hurt your feelings by saying no and end up unhappy. You need to make it clear to them that if they see something that isn’t working, they need to point it out. Otherwise, you will show them the same thing again and again until the project runs out of time and money and the client gets stuck with a solution they don't want. When it's time to show your work during an official meeting to multiple stakeholders, arrange several informal pre-meetings with each of them to avoid the “big reveal”. These may seem like unnecessary conversations, but during your presentation, the stakeholders will smile knowingly and affirmatively nod their heads. There won't be any puzzled “I’m processing it” expressions because you gave them the time and space to think, establish their opinion, and give you their support.